Sound has lent more grace, character and meaning to movies. Alam Ara, India’s first talkie made by Ardeshir M. Irani, exhibitor–turned-filmmaker under the banner of Imperial Movietone, was released on March 14, 1931 at Majestic cinema in Bombay. The 10,500–foot-long costume and fantasy drama was made in Hindi and Urdu. While Irani directed the movie, wrote the screenplay and handled the sound recording department, using Taran Sound System, Joseph David got the distinction of becoming India’s first film dialogue writer. Zubeida played the title role in the movie which also starred Master Vithal, Zillu, Sushila, Prithviraj Kapoor, Elizer, Wazeer Mohammed Khan and Jagdish Sethi. Its story revolved round a king and his two queens, Navbahaar and Dilbahaar, both childless. A fakir tells Navbahaar that she would be blessed with a son but he would survive after his 18th birthday only if the queen got hold of a necklace woven round the neck of a fish which would appear only once in the lake of the palace on that particular birthday of the Prince. Navbahaar gets blessed with a son whom she names Qamar, while Dilbahaar loves senapati Adil, who resists her advances. Once while she is trying to seduce him, they are spotted by the king. Dilbahaar charges Adil with trying to molest her. An enraged king orders the arrest of Adil and evicts his pregnant wife, Mehar Nigar, from the palace. Mehar gives birth to a daughter who is named Alam Ara and dies after telling a shikari everything about her husband. The shikari brings up Alam Ara. Qamar and Alam Ara grow up. Dilbahaar who is jealous of the other queen and knows about the condition pertaining to Qamar’s survival, replaces the actual necklace with a fake one when the fish appears on Qamar’s 18th birthday. Navbahaar fails to get the right necklace on the scheduled day which results in Qamar’s death. However, his family does not dispose of his body and starts looking for the fakir to know what had gone wrong. On the other end, when Alam Ara comes to know from the shikari about the agony of her innocent father, she vows to secure his release from the jail. Qamar’s body comes to life every night when Dilbahaar removes her necklace and becomes lifeless again when the queen wears it in the morning. Alam Ara, on one of her visits to the palace at night, finds Qamar alive and falls in love with him. Ultimately, everybody comes to know about Dilbhaar’s foulplay. Qamar’s family gets the right necklace. Adil is released and Qamar and Alam Ara live happily ever after. According to Harmandir Singh ‘Hamraaz’, pioneer of Hindi film music research, the movie had seven songs. All the numbers were composed by Ferozshah Mistri, claims Ferozshah’s son, Kersi Mistri, though booklets issued at the time of the release of the movie mention B. Irani too as one of the composers. Its song De de khuda ke naam pe pyaare taaqat ho gar dene ki, kuch chaahe agar to maang le mujhse himmat ho gar lene ki' was the first song of the Indian cinema which became a rage in those days. Actor Wazeer Mohammed Khan, playing fakir rendered it on the screen as the playback singing technique was not prevalent at that time. The other numbers in the movie were Badla dilwayega yaar ab tu sitamgaaron se'; Rootha hai aasmaan' ; Teri kateelee nigaahon ne mara'; De dil ko aaram aey saaki gulfaam'; Bhar bhar ke jaam pila ja'; and Daras bin morey hain tarse nayna pyare'. Only harmonium and tabla were used as musical support for the songs. Shooting the first talkie indeed proved to be a tough task for Irani who had earlier made some silent movies without any difficulty. Since there were no soundproof recording studios at that time, the film was shot at night behind closed doors to minimise the possibility of outside voices encroaching upon the film’s soundtrack. The microphone would be cleverly concealed somewhere around the actor. The movie turned out to be a goldmine at the box-office. However, none of the prints of the film is available now. During the last 75 years, film folk have exploited sound to the hilt to create magic of several kinds on the screen. A few of them may not have really succeeded in mesmerising the audience but their names find mention in record books. Here is a recap of some of the interesting moments related to sound in Hindi films. 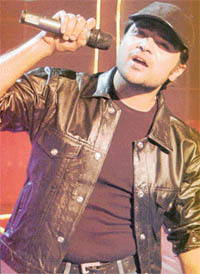 Himesh Reshamiya is an accomplished music director who has been active in the film world for the past many years. None of his films fetched him a Filmfare award as a composer. However, last year he made his debut as a singer in Aashiq Banaya Aapne and lo! It fetched him the coveted award for Best Male Playback Singer at this year’s awards function. 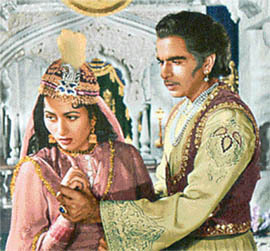 In 2004, K. Asif’s Mughal-e-Azam, a 1960 movie with most portions in black and white, was fully colourised and its sound digitally refurbished. This was the first time in the world that such an experiment was performed for the big screen. Incidentally, when Naushad had originally composed its number Ae mohabbat zindabad', he used a chorus of 100 singers for it. In the same year, Yash Chopra produced and directed Veer-Zaara in which he used the tunes of Madan Mohan nearly three decades after his death. 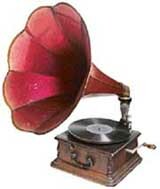 Madan had composed and preserved these tunes but did not live long enough to use them. Yash engaged Javed Akhtar to write the lyrics for these tunes, which Madan’s son, Sanjeev Kohli, reworked on to conform them to modern tastes. In the latter part of the 20th century, picturisation of songs at a massive cost became a fad in Bollywood. The craze reached its crescendo in 2003 when Boney Kapoor spent a cool Rs 1 crore on the picturisation of a song (Tere bina') in his film Khushi, made in 2003. The last Friday of 2003 saw the release of J.P. Dutta’s LOC Kargil, for which Anu Malik recorded the longest ever song (Main kahin bhi rahoon') for an Indian film. The over 20-minute long number, penned by Javed Akhtar, was rendered by Roop Kumar Rathod, Sukhwinder Singh, Hariharan, Udit Narayan and Sonu Nigam A couple of years earlier, TV actor Ananth Mahadevan too did something unusual while making his directorial debut with Dil Vil Pyaar Vyaar. Instead of getting songs recorded, he recycled some of the most popular songs of R. D. Burman from different movies. Music arranger Bablu Chakravarty touched them up a little. K.C. 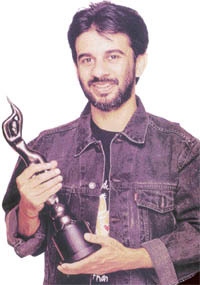 Bokadia made Hum Tumhare Hain Sanam in the same year for which he engaged as many as six music directors that included two teams (Nadeem Shravan, Bappi Lahiri, Jaideep, Nikhil-Vinay, Bali Brahmbhatt and Dabboo Malik). Sunny Deol’s Dillagi (1999) might have been a forgettable movie but its title song stands in the record books rendered as it was by nine established singers (Abhijeet, Sonu Nigam, Sukhwinder Singh, Shankar Mahadevan, Shaan, Alka Yagnik, Mahalaxmi, Kavita Krishnamoorthy and Jaspinder Narula). It is not uncommon to see actors singing some song in imagination or dream. However, in Mahesh Bhatt’s The Gentleman (1994), a new record was created where all six songs were in imagination or dream of one actor or the other! In 1993, Kumar Sanu created a world record by recording 28 songs in a single day. The feat helped him get a mention in Guinness Book of World Records. 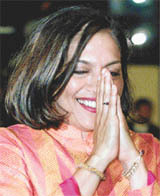 Sometime in the early 1980s, a reputed film magazine carried a tongue-in-cheek remark sent by a woman: "I am fed up of so much noise in Hindi films. Can we not return to silent era, please?" Come to think of it, two South Indian producers, Sringar Nagaraj and Singeetam Srinivasa Rao actually made a silent film called Pushpak in 1987, starring Kamal Hassan and Amla. Kashish (1980), a film starring Navin Nishchal and Reena Roy and directed by Amin Chaudhary, was made by an NRI outside India. Though exhibition of Indian movies is not allowed in Pakistan, makers of Kashish, a Hindi film, argued with the Pakistan authorities that it could not really be categorised as an "Indian" film as it was shot outside the boundaries of India. He finally managed to secure permission to exhibit the film in that country. However, the makers had to change the Hindu names in the film to Muslim ones through the dubbing process for the version meant for Pakistan. So while we in India had, say, Naveen wooing Sheela, in Pakistan there was the same actor with the name Nadeem running after Salma! The movie bombed in both the countries. So who says there is no unity between the people of India and Pakistan? All films have to go through a process called re-recording or dubbing when original voices are erased from the soundtrack and dialogue re-uttered by actors in the quiet atmosphere of recording studios. This is done to eliminate unnecessary sounds from the surroundings which mingle with the dialogue. However, Meera Nair made Salaam Bombay (1988), which was later nominated for Oscars, without getting it dubbed. Tarachand Barjatya came up with a film called Saawan Ko Aane Do in 1979. It had as many as eight lyricists (Indeevar, Maya Govind, Gauhar Kanpuri,Pooran Kumar ‘Hosh’, Abhilash, Purshottam Pankaj, Madan Bharti and Faunk Jami) penning its 10 songs. Cine-goers might have totally rejected this Kanak Mishra-directed musical but its record recently came up as a question in a popular quiz programme of a TV channel (Which movie had the maximum number of lyricists?"). V. Shantaram made his Chaani (1977) without any background music. Only natural sounds like those of chirping of birds were used in the background. Interestingly, it had four songs for which composer Hridaynath Mangeshkar too used natural sounds like tapping of a boat with feet by a boatman. The movie, however, did not find many takers. (Way back in 1935, Shantaram had made Duniya na Maane which too was without background music). Renowned filmmaker Chetan Anand made Heer Raanjha in1970. Guess what? All its dialogue in verse! At last a poem on the celluloid literally! Sunil Dutt made a film called Yaadein in 1964. It was unique in the sense that it starred only one actor—Sunil himself—and was shot on only one set. The movie, depicting the separation of a man from his wife and their subsequent reunion, used the voices of other actors in the background to take the story forward. Raj Kapoor was one of the legends of talkie era. Among his most talked about qualities was his unique sense of music. Though he never officially took the credit for music for any of his films, he was believed to be the real brain behind the melody generated by the songs of his movie. Among the gems which he created (with official music directors Shanker-Jaikishan) for his film Jis Desh Mein Ganga Behti Hai (1960), one was Aa ab laut chalen'. Renowned music director Anu Malik says that he has never been able to solve the riddle as to how RK produced the very, very unusual chorus voice after the words aaja re-e-e-e in this number! In 1932 J.S. Maadan made a film called Indrasabha which had as many as 71 songs! Vazeer Khan conceived the tunes which were composed by Naagar Das. The movie finds mention as a "talkie" in record books. Will "singie" not be a more appropriate description? 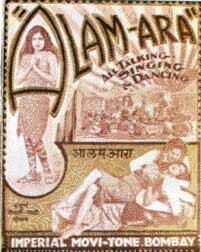 Alam Ara narrowly beat J.J. Maadan’s Shirin Farhad to become the first talkie feature film of India. Maadan’s film, however, got the distinction of becoming the first in which images and sound were recorded separately. Interestingly, even after the advent of the talkie era, silent movies continued to be made for another three years or so. More than 375 silent films were made after the release of Alam Ara. The introduction of sound brought about drastic changes in films. One of the biggest fallouts was categorisation of Indian cinema into Hindi and regional languages. In fact, in 1931 itself, three films were made in regional languages–Jamai Sasthi in Bengali, Kalidasa in Tamil and Bhakta Prahalada in Telugu. A number of stars of the silent era found themselves jobless as they did not possess a good voice. Filmmakers started picking up stars from theatre because of the quality of their voice. Since songs became an integral part of films right from the first talkie, actors with a good voice and singing talent came to be very much in demand. Still audiences had to "suffer" some bad actors as they were excellent singers and there were some bad singers who could act well. In 1935, Indian cinema took another leap forward when Nitin Bose introduced playback singing in Dhoop Chhaaon, alias Bhagya Chakra, with Pankaj Mullick and R.C.Boral as its music directors. The first number in which the playback technique was used was actually a combination of two songs. Three female playback singers—Parul Ghosh, Suprova Sarkar and Harimati—rendered the first two lines of a chorus (under the baton of Pankaj Mullick) Main khush hona chahoon khush ho na sakoon' which was later picturised as a stage show in the movie. These lines were appended to another number Aaj mero ghar Mohan aayo' which was rendered by Ahi Sanyal, an actor in the movie. However, later the part rendered by Ahi was scrapped and it was recorded in K.C.Dey’s voice. So Parul Ghosh, Suprova Sarkar and Harimati share the credit of being the first playback singer(s) of the Indian screen, according to film music researcher Harmandir Singh ‘Hamraaz’. However, Bombay Talkies claimed that it had introduced playback singing in Jawani ki Hawa, a 1935 release. With the passage of time, several new techniques and innovations made cinema-going a pleasant experience. In 1967, Pachhi introduced the Stereophonic sound technique with Around the World. Bappi Lahiri composed the first computerised song (Tamma tamma loge') for Thaanedar in 1990 ; Vidhu Vinod Chopra’s 1942 –A Love Story introduced the Dolby sound technique in 1994 and Kamal Haasan used Syncsound in his Hey! Ram (2000). The importance of sound effects has very much increased in recent times. The modern Dolby sound technique is one of the factors responsible for attracting audiences back to cinema halls. A movie like Bhoot (2003) is a glorious example of what magic can be created through sound. — S.M.